My bagel-making experiments began earlier this summer in, of all places, the modestly equipped kitchen of a rental cabin at Lake George. 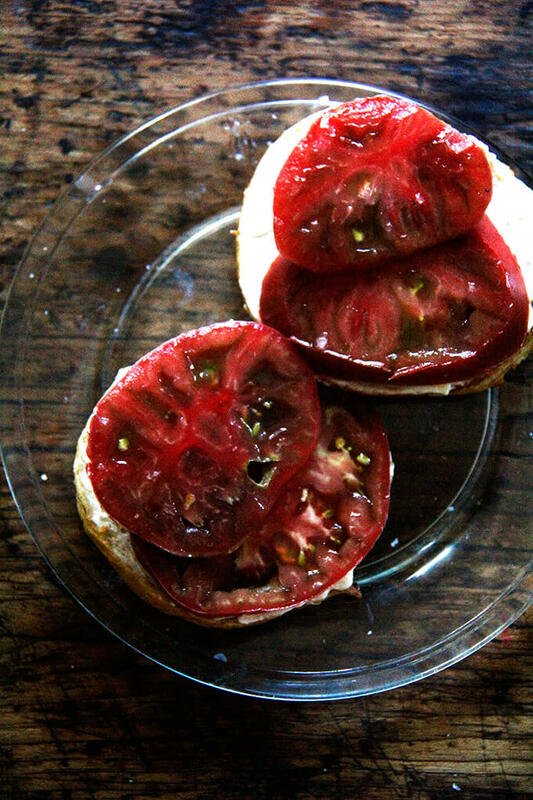 We had just tasted the first good summer tomatoes, found at a farm stand in Bolton Landing, and all at once, all I wanted to eat was a good, toasted bagel, smeared with cream cheese, topped with a beefy tomato slice, sprinkled with sea salt. I’ve longed to find/adapt/create an easy or easy-ish bagel recipe, but past summers have escaped without more than the odd experiment. It was time to take a deep or deep-ish dive. Having had success using the peasant bread dough to make many various bread forms, I hoped it might take to the bagel format, too, but I quickly learned it would not: the peasant bread dough is way too wet (high hydration*) and my first experiments yielded flat, dense disks, edible but not acceptable. I’ll spare you all the details, but after many experiments, I’ve learned that the process of making bagels is a real departure from the one I’m so used to. 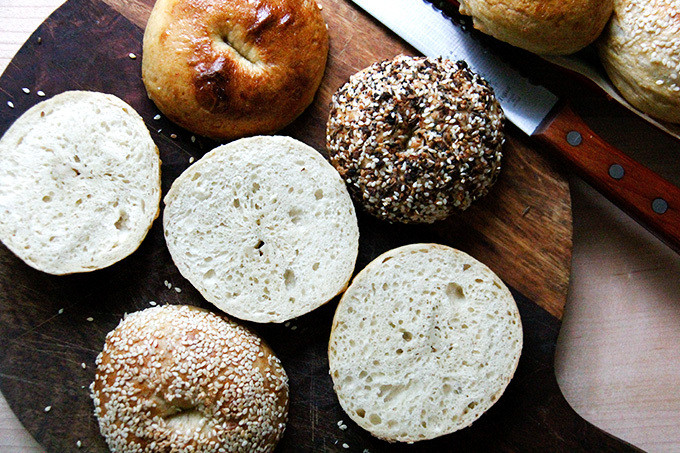 Bagels require kneading, shaping, boiling, and egg washing. But they can, I think, be easy-ish. I find these to be just that, kind of fun to make, very tasty, and perfect for my ideal breakfast this time of year. Good enough for me. I hope you approve. • To get that characteristic chewiness—in other words, to ensure bagels don’t simply taste like bread shaped like bagels—the dough needs to be kneaded. After reading a Stella Park’s article, I decided to do this in the food processor, which takes 90 seconds. • As always, a digitial scale is essential for consistent results, but it’s even more essential here—lower hydration* doughs are less forgiving. I never weigh the water for peasant bread recipes, but I do here, and I also weigh the salt, which, in this humidity, has been feeling lighter in the measuring spoons than usual. • To prevent the shaped dough rings from turning into pancakes upon being boiled, the dough hydration* needs to be relatively low. In other words, the dough should be relatively stiff. • If you have the time, an overnight rise in the fridge is best. • To get that nice, golden sheen during the baking, an egg wash is essential. 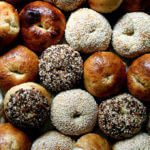 Commercial bakers often boil their bagels in a lye solution, which promotes browning and gives the bagel crust a crispness. As lye is something I am unwilling to experiment with—remember, I’ve embarked on a deep-ish dive—an egg wash is a fine substitute. It does not help with crispness, but it gives the bagels the look. 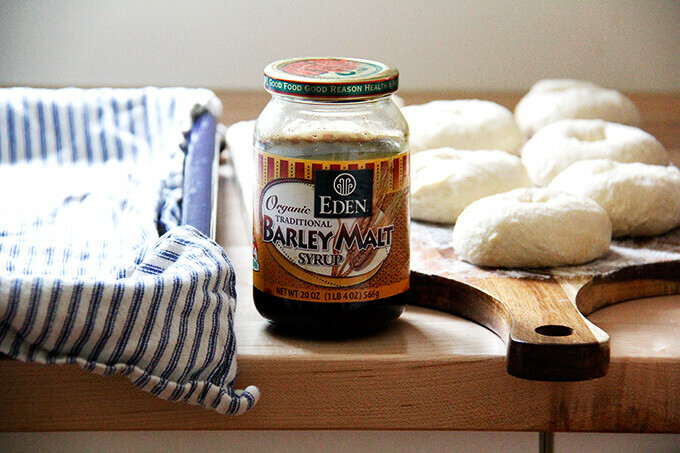 • An optional but nice ingredients to use in your homemade bagels is barley malt syrup, which can be ordered online or found in specialty shops. Stella Parks says that in addition to providing flavor, barley malt syrup promotes “a more delicate texture in the crust, one that’s chewy and crisp rather than crunchy and hard.” I’ve had a jar on hand since reading her article, and I’ve been happy with the texture of my homemade bagels as a result, but know that you can create very good bagels at home without it. I recently learned that the chef, David Wurth, of Cross Roads in Hillsdale, who makes exceptional bagels, uses maple syrup in his boiling solution, so if you don’t feel like hunting down barley malt syrup, you don’t have to. * Hydration is not something I ever talk about here or in my book, because typically I find the concept confuses and intimidates people rather than helps. Hydration is the percentage of liquid in a dough. I mention it today only because I think the most significant difference—more than kneading, boiling, shaping—between bagels and the peasant bread (and so many breads I love) is the hydration. Bagels are low hydration; peasant bread is high. 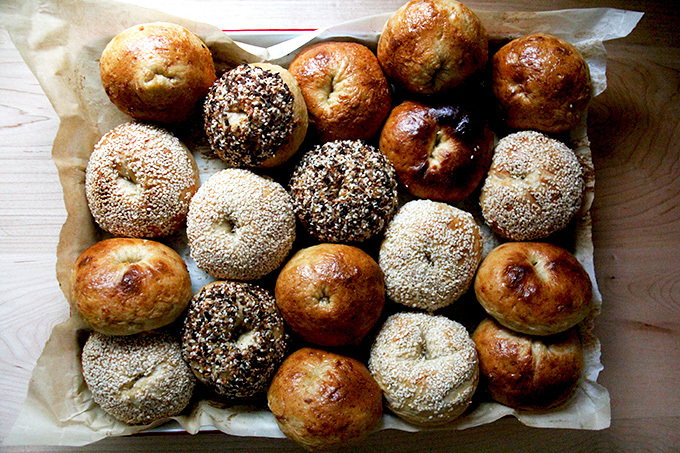 Bagels are not light and airy; they are chewy and dense. These bagels are 69% hydration (calculated by dividing the weight of the water by the weight of the flour), whereas the peasant bread dough is about 94% hydration. Use greased hands to transfer it to a bowl. Coat it with a little bit of olive or grapeseed oil. 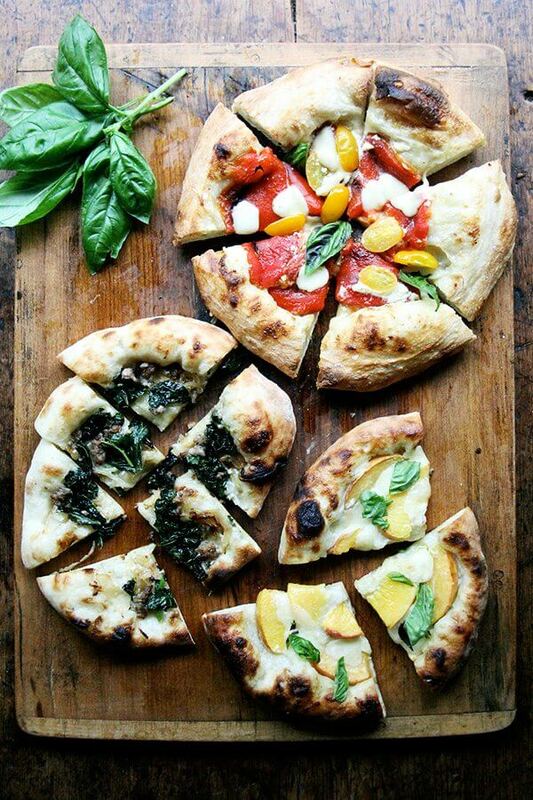 On the left: just-mixed dough. 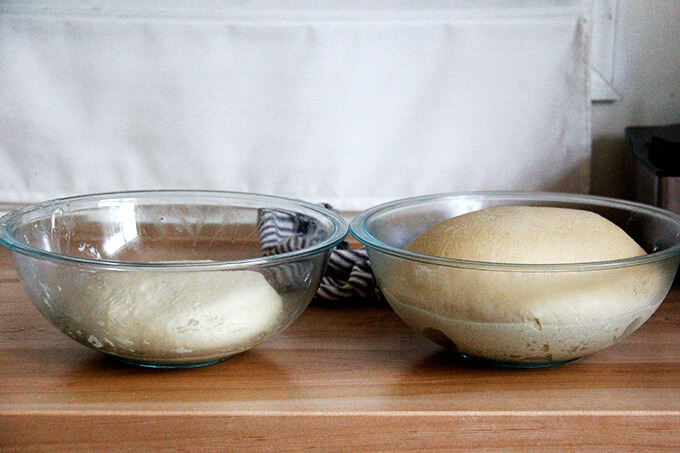 On the right: dough after a night in the fridge. You all have one of these, right? 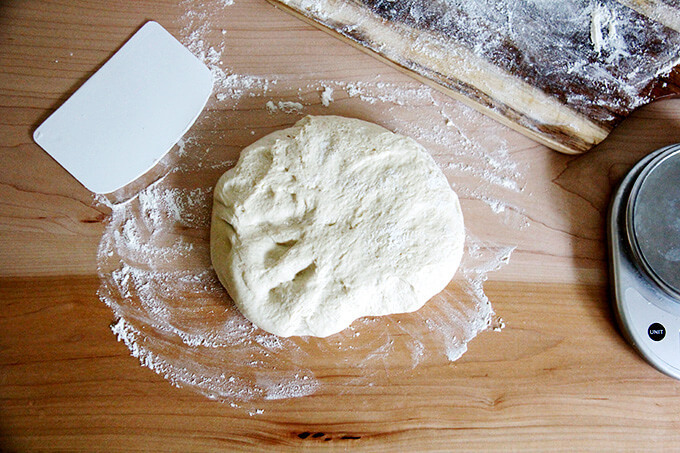 After 12 hours (or more or less) in the fridge, turn the dough out onto a lightly floured work surface. Shape them into rings, by using your thumb to poke a hole in the center of the round, then both hands to stretch the dough out and under—don’t afraid to be aggressive. Video guidance here. 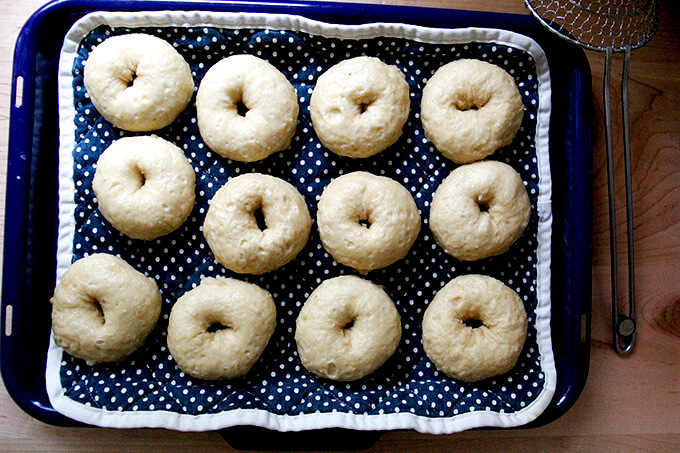 Transfer boiled bagels to a tea towel-lined sheet pan. Find yourself some good tomatoes; enter summer-morning breakfast nirvana. If you like visual how-to instruction, here’s a play-by-play in Instagram stories. As noted above, I find a scale to be imperative here: I use it to weigh not only the flour but also the water, salt, and yeast. 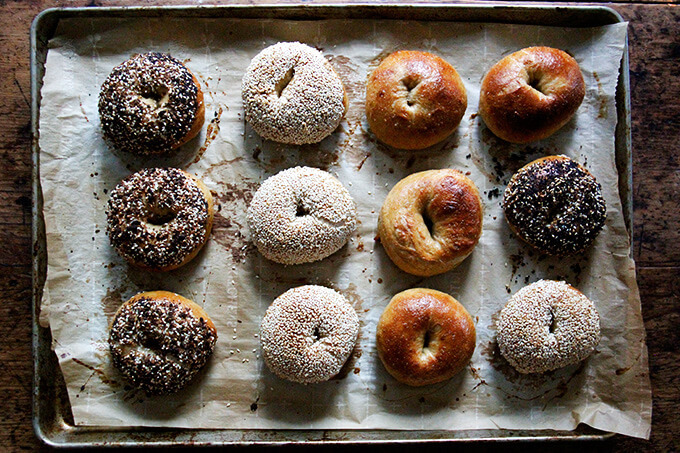 A large sheet pan is so handy — it fits all 12 bagels at once. 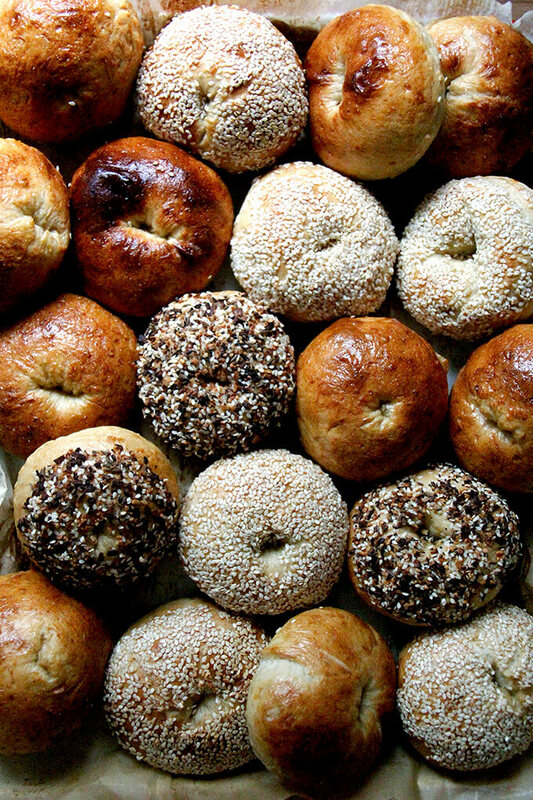 You’ll need a spider or a slotted spoon to remove the bagels from the boiling water to a sheet pan. 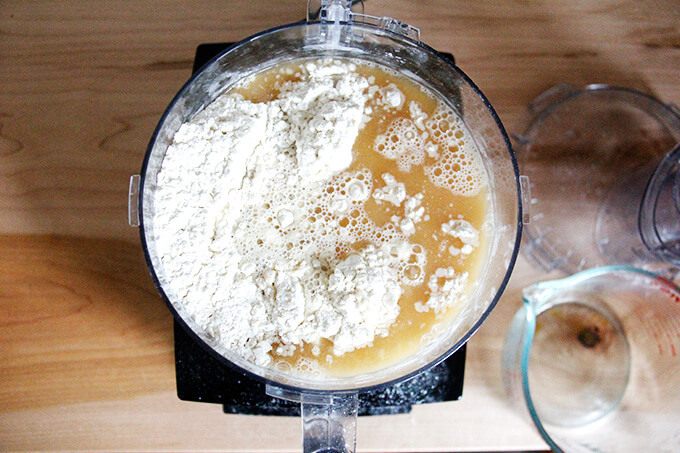 A food processor or stand mixer will allow you to knead the dough quickly and powerfully. I love my 14-cup Cuisinart. Note: Watch your food processor closely! If you make the larger amount (12 bagels), it’s a lot of dough for even a large food processor. You’ll only run the machine for 90 seconds, but it will work hard during those 90 seconds and may jump around a bit. Also, after you add the liquids to the food processor, begin the kneading immediately to prevent the liquid from escaping through the center hole. If you don’t have a food processor or a stand mixer, knead the dough by hand briefly, using as little additional flour as possible. Many bread authorities swear by using high-gluten flour. This is something I have yet to try, but I imagine it would only improve the chewiness. 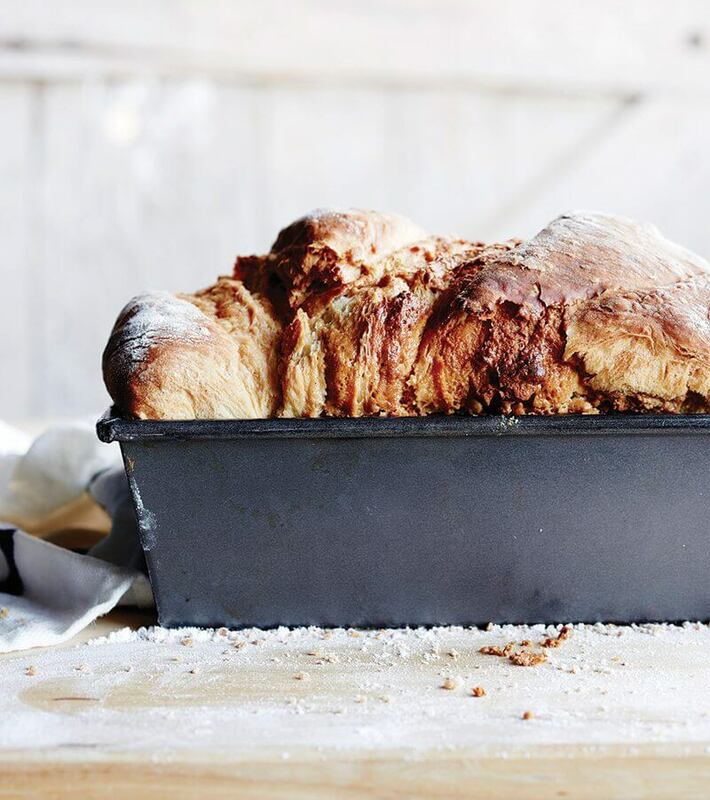 But if you don’t feel like picking up another product, don’t hesitate to use all-purpose flour, which is what I typically use in all of the breads I bake. Barley malt syrup is hard to find. Shops like Whole Foods Market typically sell it. I order it online. various toppings: everything bagel seasoning, sesame seeds, dukkah, etc. 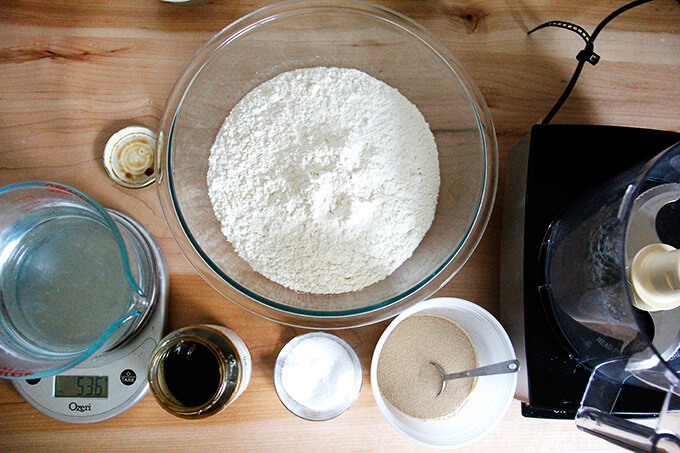 In the bowl of a food processor fitted with the blade attachment, pulse together the flour, salt and yeast. 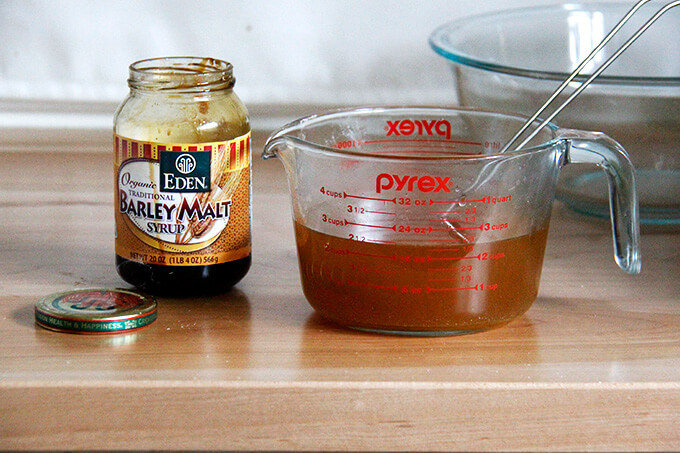 In a medium bowl, whisk together the water and the barley malt syrup. Add it to the food processor and immediately (see notes for why) purée for 90 seconds, standing nearby the entire time. 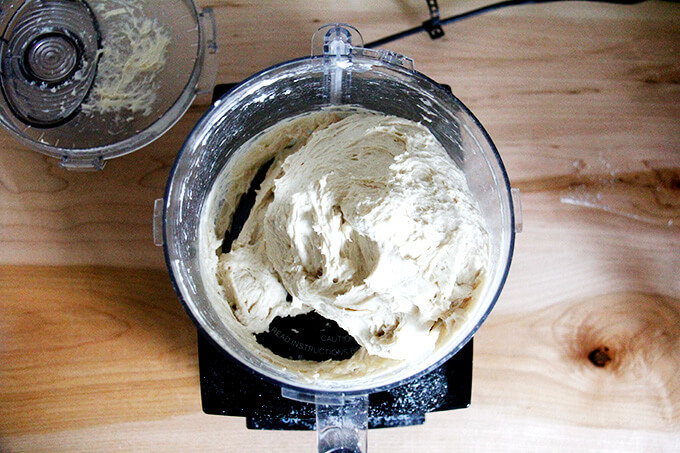 With oiled hands, transfer the dough from the food processor to the bowl. 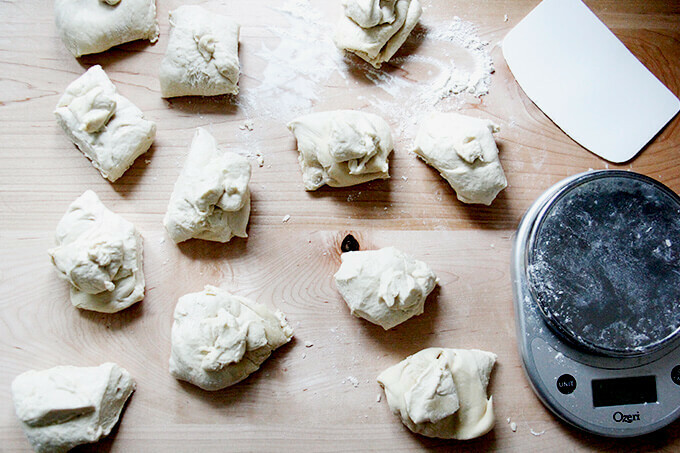 The dough will feel warm and sticky. With oiled hands stretch the dough up, then down toward the center several times to form a ball. 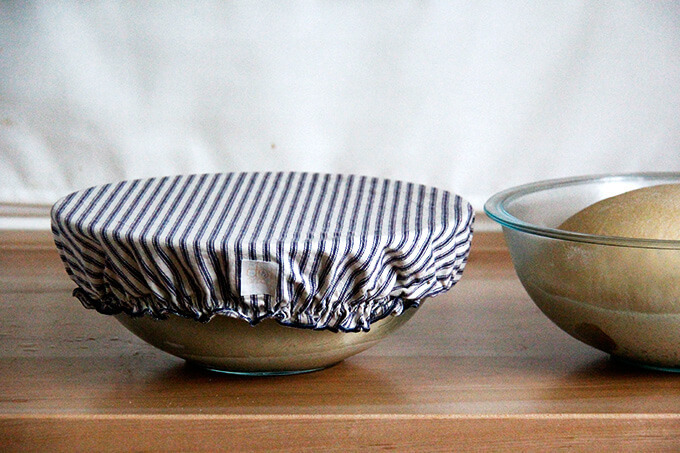 Cover with a tea towel, cloth bowl cover or plastic wrap. Transfer bowl to the fridge for 12 hours or longer. Place a large pot of water on to boil. When it simmers, add a big glug (about ¼ cup) barley malt syrup. Preheat an oven to 425ºF. Line two sheet pans or one large pan one with parchment paper. Prepare the egg wash if you haven’t already. Place toppings of choice in shallow bowls. Remove bowl with dough from fridge. Turn dough out onto a lightly floured work surface. 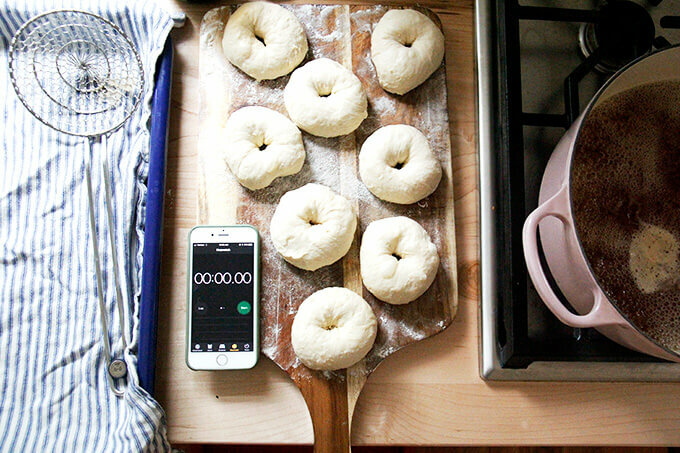 For perfectly even bagels, use your scale to portion the dough into 8 or 12 pieces, depending on the quantity of dough you made—if you weighed your ingredients, each dough ball should weigh about 105 to 110 g. Form each portion into a ball, using the pinky edges of your fingers to create tension. 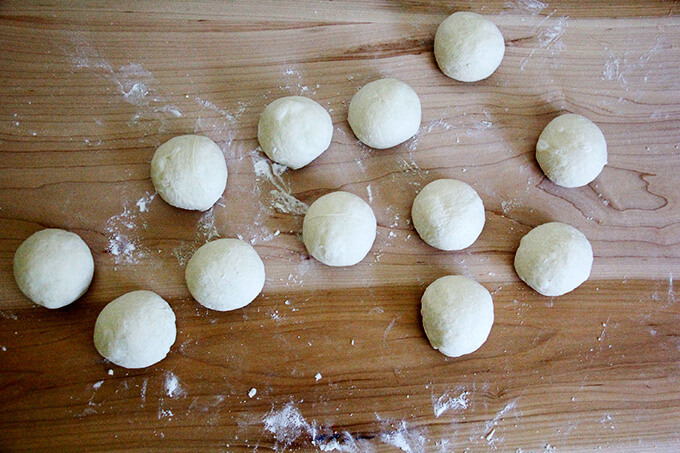 After all of the balls have been formed, dust your hands with flour and use your thumb to poke a hole into the center of each dough ball. 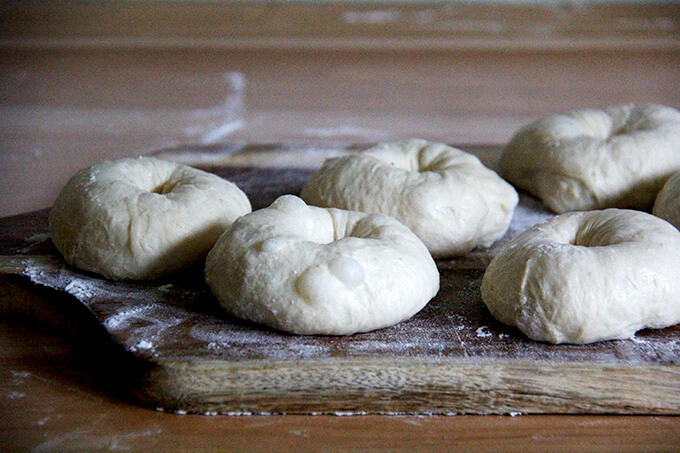 Use your hands to stretch the dough into a donut-shape—don’t be afraid to really tug outward and under, almost as if you were going to turn the dough inside out but stop before you do (video guidance here). Note: If you don’t pull out and under, the bagels will puff into cone-liked shapes upon baking. Line a sheet pan with a tea towel. Have a stopwatch (or your phone or a clock) nearby. 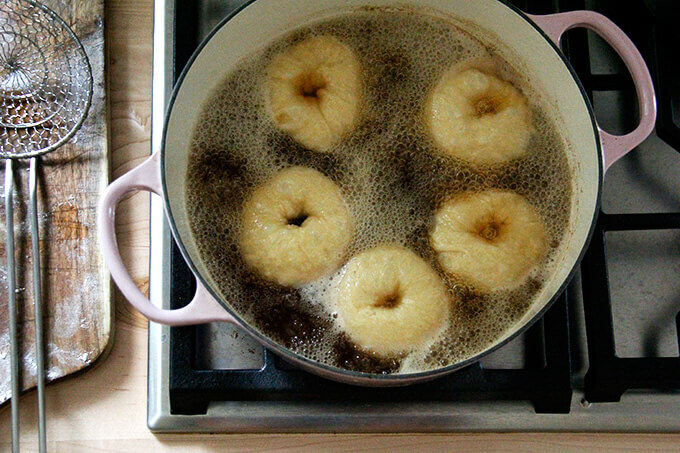 Drop 4 of the dough rings into the boiling water at one time. Boil 30 seconds on each side. Use a spider or slotted spoon to transfer the boiled rings to the towel-lined pan. Repeat until all of the rings have been boiled. Transfer rings to a sheet pan—if you an extra large sheet pan (see notes), you can bake all 12 at once. If you have a smaller pan, bake 6 to 8 at one time. Brush each ring with the egg wash. If you are using any toppings, dip the egg-washed bagels into the topping-filled bowls, then transfer back to sheet pan. 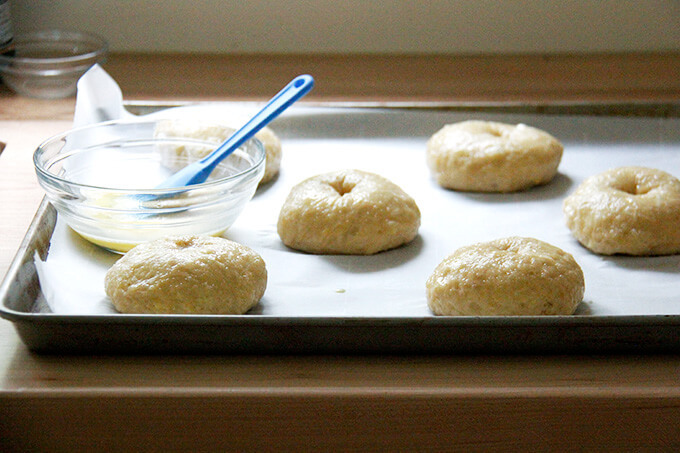 Transfer pans to the oven and bake for 20 to 25 minutes or until bagels are evenly golden all around. 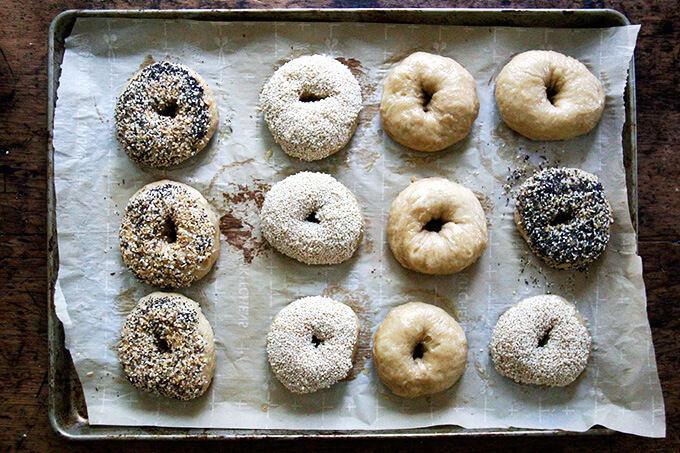 Let bagels cool on sheet pans. Your bagels look wonderful and I’m always willing to try a new recipe. Thanks for the write up! Ali, #1 You never fail to amaze me. #2 Your bagels look awesome. #3 That’s a modestly equipped kitchen!?!? 🙂 Looks nicer and better equipped than my last 4 kitchens. – Hugs! 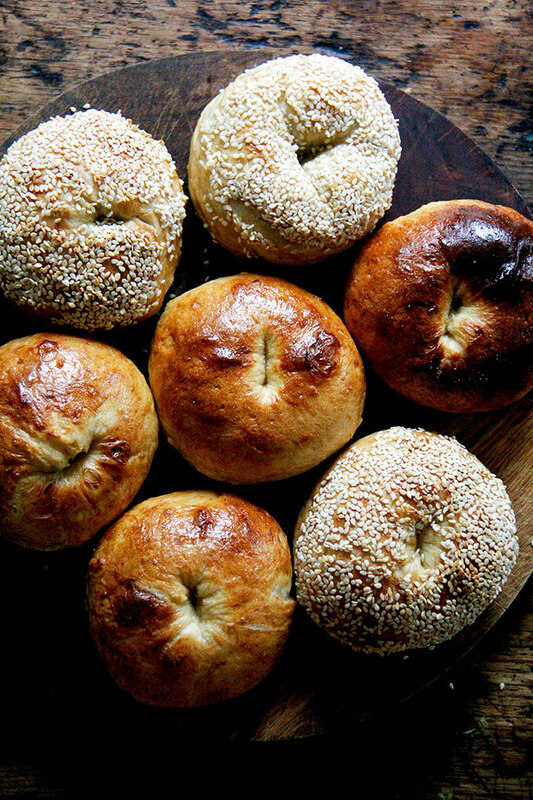 These bagels look glorious Ali and I am so eager to try this recipe! I loved the video too – you are so natural on TV! Oh dear god, these look sensational – I could never make them because if I did – I’d forget the bit about inviting friends over and just eat them all myself!! I’m dying to make these but 1question-After its risen overnight and you turn it out and portion and form, do you let them rise again? Or rest? These do look amazing! Thank you so much. Hi Trish! No rest in between. I think bc, at least where I am right now, it is very warm and humid, shortly after the bagels are formed and stretched, they feel very soft/pillowy/comfortable with their surroundings. Also, I think if you let them proof too much, they’ll deflate in the water anyway. If you need more time, you could definitely shape the bagels, then stick them back in the fridge till you are ready to boil. Many recipes call of another rest in the fridge. I bake them and they were a success. Another dough is in the fridge tonight. Next time I’d like to shape them right away, leave them in the fridge overnight (covered) and proceed with the baking the following day. This is what I wanted to do this tonight but I didn’t….. Thanks a lot for the recipe, another one of yours that is a keeper! So happy to hear this, Caroline! Keep me posted if you experiment with another method. I’m curious! You are so sweet, thank you 🙂 🙂 🙂 Hope you like the eggplant and gazpacho. Thanks so much for reporting back on the other shaping method—good to know letting the dough rise in bulk first is the preferred method. So happy you like the bagels! P.s. I am slowly making my way through your book and all the recipes are amazing! Have you ever tried a mix of half whole wheat flour and half white? I have not with this recipe, but you definitely could give it a try. The bagels may be a little denser, but I think the texture will still be really nice. Good luck!